Cambridge Audio set the benchmark for sound quality and value when they introduced the original DacMagic digital-to-analog converter. It helped music lovers significantly upgrade the sound from their computers, game consoles, network music players, or any other device with a digital audio output. Now Cambridge has raised the bar even higher with their latest offering, the DacMagic Plus. This impressive new DAC offers more features and flexibility than its predecessor, including a dedicated headphone amp for private listening, upgraded USB input capability, and optional Bluetooth® wireless connectivity. Connect the DacMagic Plus between your music source's digital audio output and your receiver, amp, or powered speakers, and this versatile DAC will bypass the one inside your PC or player — magically transforming those cold hard zeroes and ones into warm, organic sound. You'll immediately experience greater dynamic impact and transparency, with instruments and vocals standing out from each other to occupy their own distinct space. The DacMagic Plus comes packed with advanced circuitry designed to extract the best possible sound from all your digital sources. Twin Wolfson DACs are used in a dual differential configuration to cancel out noise and distortion while providing excellent stereo imaging. Cambridge's sophisticated Adapted Time Filter 2 technology upsamples all incoming digital audio to a 24-bit/384kHz signal in order to resolve extremely fine detail. The end result is dramatically improved sound from every digital source in your system. Standard USB outputs from most computers pose a serious limitation to sound quality. That's because while you're trying to listen to music, your PC is busy performing virus scans, data backup, and other background tasks that may take priority over your tunes, causing it to alter the data rate to suit its own needs. Unfortunately, this situation results in timing errors within the digital data stream — known as "jitter" — that adversely affect sound quality. Jitter can make your music sound harsh and edgy, and smear subtle details. The newly re-designed DacMagic Plus solves this problem by reaching out to your computer through the USB interface, and instructing it to relinquish control of the data stream timing. In its place, this advanced DAC inserts its own separate, or asynchronous, clock to precisely control the timing of the data rate, reducing jitter to the vanishing point. You'll hear a stunning improvement in low-level ambient detail along with a wider, deeper soundstage. Along with all the sonic benefits the DacMagic Plus provides for your compressed and CD-quality music files, it also has another trick up its sleeve — it decodes high-resolution data streams with up to 24-bit/192kHz resolution through its USB connection, so you can enjoy better-than-CD audio quality. Cambridge Audio also included some neat features guaranteed to appeal to audiophiles. A choice of three digital filters lets you tweak and fine-tune the sound to match your system and room. The DacMagic Plus lets you experiment with different filter settings for each source, always remembering the last setting assigned to each one. A phase inversion switch lets you correct for out-of-phase recordings or amplifiers that invert phase. Cambridge even included an incoming sample rate indicator which shows the original source quality. The DacMagic Plus offers multiple digital inputs for all of your sound sources plus RCA and pro-quality XLR outputs. two coaxial digital inputs: ideal for connecting a CD or DVD player, Logitech Squeezebox™ Touch, Sonos® Connect, or any other digital audio component with coax out, and taking advantage of the DacMagic Plus's high-performance processor for better sound. two optical digital inputs: ready to take on almost any HDTV, set-top box, game console, or other digital sources with optical digital output, and feed a high-quality audio signal into your stereo system. Type B USB jack feeds digital audio from your computer into the DacMagic Plus's onboard digital-to-analog converter, bypassing your computer's sound card to yield much clearer sound with stored music files and Internet radio. A pair of gold-plated RCA outputs lets you connect the DacMagic Plus to your home audio system's receiver or integrated amp. Or feed a set of powered speakers for a high-end, compact desktop stereo. The built-in volume control even lets you connect a power amp directly, using the DacMagic Plus as a preamp. Cambridge Audio also included a pair of balanced XLR outputs for an even higher-quality hookup with compatible audio components. A full-size headphone jack lets you take advantage of the DAC's built-in headphone amp for private listening. Optical and coaxial digital outputs allow you to bypass the DacMagic Plus when you're playing surround sound from a Blu-ray or DVD player, so you don't have to change cable connections when you switch from music to movies. 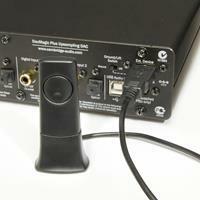 Use the BT100 Bluetooth audio adapter for wireless digital transmission to the DacMagicPlus. You can also go cable-free with Cambridge Audio's optional plug-and-play BT100 Bluetooth® wireless audio receiver.This receiver lets you stream music wirelessly from your iPhone®, Android™ smartphone, iPad®, tablet, laptop or any device that supports Bluetooth audio. Best of all, if your smartphone, tablet, or computer supports high-end CSR aptX® Bluetooth audio, you can stream near CD-quality music from your device to the DacMagic Plus.